These cool creamy dishes deliver plenty of flavor with little or no need for the oven. 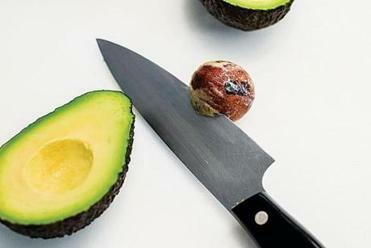 Tip: Place the avocado half with the pit on a work surface and gently strike the center of the pit with the edge of a knife blade, just hard enough to barely embed the blade in the pit. With a lifting and twisting motion, pull up the knife and the pit will dislodge and come with it. Carefully remove the pit from the blade. Because avocados brown as they oxidize, the soup is at its best the day it’s made; after 24 hours it will taste fine but look a little dingy. Thin slices of lime are the de rigueur garnish. Other possibilities include sliced radish, minced red onion, slivers of pickled red onion, finely chopped tomato, a couple of thin rings of fresh jalapeno or serrano chili, crumbled Cotija cheese, sliced scallion, and chopped cilantro. As with any cold soup, chilled serving bowls are a nice touch. 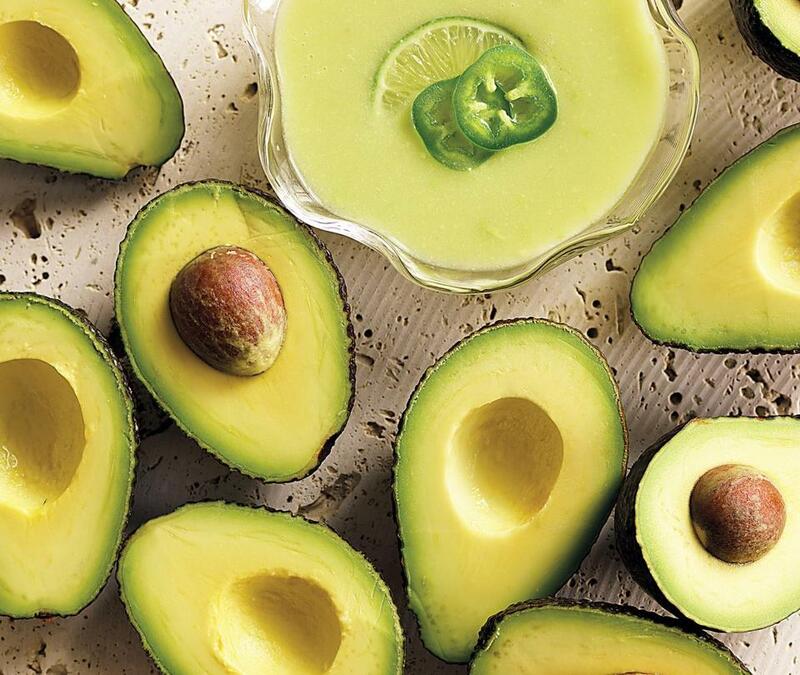 In a blender, and working in batches, puree the onion, avocados, chicken broth, cumin, hot pepper sauce, lime juice, cold water, and 1 teaspoon salt until very smooth, at least 40 seconds. Pour the batches into a large bowl (preferably stainless steel) and stir to mix. Cover and refrigerate until cold, about 3 hours. At serving time, stir the soup to reblend. Taste and adjust seasoning with salt, black pepper, and/or lime juice, if necessary. Serve at once, garnishing each bowl as desired. 1) In a large nonstick skillet over medium heat, add 12 ounces tomatillos (about 9 medium), husked, washed, and halved, cut sides down, and 3 medium peeled garlic cloves. Cook until tomatillos soften and brown lightly, about 12 minutes (turning tomatillos over and removing garlic cloves halfway through). 2) Increase cumin to ½ teaspoon; decrease chicken broth to 2¼ cups and lime juice to 1½ tablespoons. 3) Proceed with the recipe as directed, adding the tomatillos and garlic to the blender along with the other ingredients. 1) Remove the husks and silk from 6 medium ears of corn. Cut the kernels off the cobs; reserve both kernels and cobs. 2) In a Dutch oven over medium-high heat, bring the cobs, broth, and 2 cups water to a strong simmer. Cover the pan and set aside off heat to steep until liquid acquires a subtle corn flavor, at least 45 minutes. Remove cobs, return pot to medium-high heat, and bring to a strong simmer. Add kernels and 1 teaspoon salt and simmer until the corn is tender, about 7 minutes. Set the pot aside off heat. Remove ½ cup of corn kernels; cover and refrigerate. 3) In a blender, puree corn with cooking liquid in batches until very smooth, about 40 seconds. Strain each batch through a fine-mesh strainer into a large bowl, pressing to release as much liquid and smooth corn puree as possible; discard solids. 4) Substitute 2 teaspoons minced, seeded serrano chili and 1 teaspoon minced garlic for the hot pepper sauce, and decrease lime juice to 2 tablespoons. Proceed with the recipe as directed, adding corn liquid to blender along with the other ingredients. 5) Garnish with reserved corn kernels and other garnishes of choice. 1) Set the broiler rack about 6 inches below element and heat broiler. Put 2 pounds poblano peppers on baking sheet and broil, turning them every 2 minutes, until evenly blackened, about 9 minutes. Place poblanos in a large heat-resistant bowl, cover, and steam to loosen the skins, about 15 minutes. Scrape away the skins and seeds and reserve flesh. 2) Decrease the broth to 2 cups and substitute 2½ cups buttermilk for the cold water. 3) Substitute 1½ teaspoons minced, seeded serrano chili, 1 teaspoon minced garlic, and ¼ cup chopped fresh cilantro for the hot pepper sauce, and decrease lime juice to 1½ tablespoons. 4) Proceed with the recipe as directed, adding poblano flesh to blender along with the other ingredients. 1) Reserve a couple of small dill fronds and thinly slice a lemon to use as garnish. Peel 1 medium English cucumber (about 1 pound); finely chop enough for about ½ cup, and roughly chop the rest. Refrigerate the reserved dill fronds, lemon slices, and finely chopped cucumber until serving. 2) Substitute the roughly chopped cucumber for the cold water, ¾ cup chopped dill for the cumin and hot pepper sauce, and 1½ tablespoons lemon juice for the lime juice. Proceed with the recipe as directed. 3) Garnish with finely chopped cucumber, dill fronds, and lemon slices.